A physicist in the College of Arts and Sciences has received a major award to study the mechanics of how biological cells move in tissues. The award also supports the creation of related education initiatives, designed to benefit undergraduates. Manning’s proposed research focuses on the behavior of biological cells. Sometimes these cells behave like a liquid, rearranging themselves to move over relatively large distances. This is common during wound healing, embryonic development and the growth of cancer tumors. Manning and her students will study groups of cancer cells, trying to infer how single-cell mechanical properties predict tumor organization and large-scale mechanical responses. They also will investigate how structures such as the cytoskeleton reorganize themselves to influence large-scale properties of dense cell masses. Manning’s ultimate goal is to devise a theoretical framework for describing how cells control “jamming” transitions in tissues. The Cottrell Scholar Award also recognizes excellence in teaching and academic leadership. 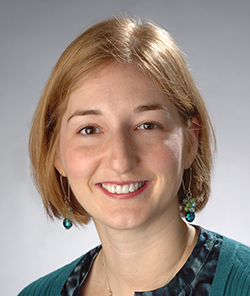 As part of the education component of her award, Manning will develop an online assessment tool for use in introductory physics courses, as well as biophysics modules to help explain cutting-edge research. She also will create a course that trains graduate students and undergraduate peer coaches to better assist students in these introductory courses.